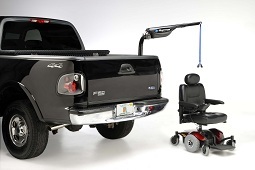 AmeriGlide's Univeral 400 PR lift features powered rotation so you can load and unload your scooter or powerchair with ultimate ease! This vehicle lift has a 400-pound weight capacity and is compatible with almost any electric scooter or power wheelchair. 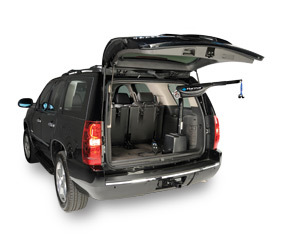 An integrated offset post ensures your mobility device will clear your vehicle's bumper without leaving unsightly scratches, and the adjustable base can be configured to perfectly match your vehicle's dimension. The adjustable telescoping boom arm aids users in easily attaching the lift strap to a scooter or power chair. 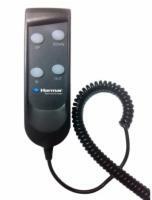 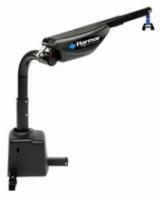 Remote hand control, weather resistant coating, and removable hook all come standard!